Twice-Baked Potatoes With Comté And Spring Onions. Hello again. Twice-baked potatoes with Comté And spring onions anyone? How tasty! A twist on my most popular side dish, loved by adults and children alike. The potatoes are baked, then the fluffy insides are mixed with soured cream, spring onions and Comté, put back in the skins and baked until crisp and golden. Even better, they can be made in advance and frozen. 1. Heat the oven to 180℃ fan. Rub the potatoes lightly with a little oil and bake them for 45 minutes to 1 hour, until the skin is crisp and brown and the flesh is soft. Leave them until cool enough to handle. 3. When ready to cook, heat the oven to 190℃ fan and cook the potatoes for about 20 minutes until they are hot through, then turn on the grill for a further 2 to 5 minutes until the tops are speckled with brown and crispy. 4. At this point, the potatoes can sit, covered, at room temperature for up to a few hours or longer in the fridge until ready to cook. Or you can lay them on a baking tray to freeze them and, once frozen, keep them in a sealed bag for up to 3 months. Defrost fully at room temperature before cooking as per the recipe. 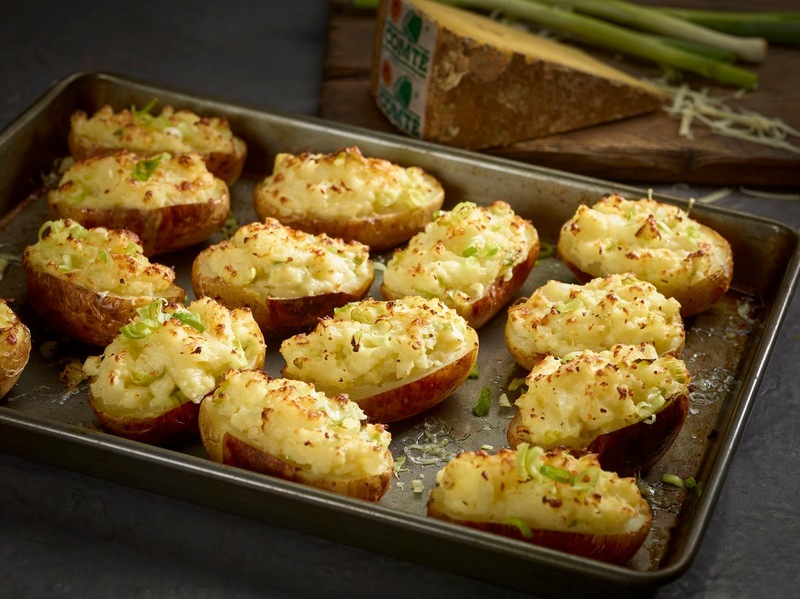 Twice-Baked Potatoes With Comté And Spring Onions Recipe and image courtesy of Comté. What do you think of this Twice-Baked Potatoes With Comté And Spring Onions recipe? Butternut Squash, Sage & Comté Risotto. Watercress, Beetroot & Fennel Salad With Comté, Basil & Walnut Crostini. How To Make Franco-Welsh rarebit with Comté. How To Make Brussels Sprout & Comté Gratin. Comté And Asparagus Puff Pastry Tart. "How To Make Franco-Welsh rarebit With Comté"
"Chocolate Chip Day: Creative Mondays Blog Hop"
You just post these lovely yummyness, I can't keep up trying them out. My wife just looves them! Oh my, this looks so delicious! I love baked potatoes, and your recipe is amazing! Pinning it! Ooh I love jackets with cheese. Tasty.